The Gowanus Lounge: A "Generation of Cover-Up" on the Greenpoint Oil Spill? A "Generation of Cover-Up" on the Greenpoint Oil Spill? The monstrous Greenpoint oil spill is one of those stories that is so horrendous and such a symbol of government's basic failure and ineptitude, that it's hard whether to know to laugh, scream or cry. 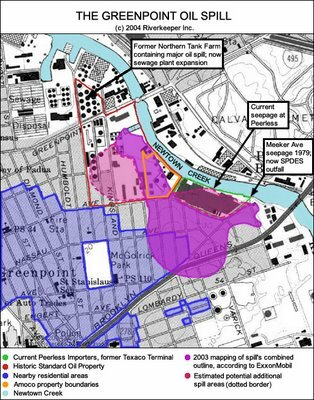 We're fairly certain that when the full health implications for Greenpoint residents are known in coming generations that it will be considered New York City's Love Canal or, at the very least, a toxic threat that was ignored for decades. Then, on Monday, Sen. Charles Schumer, Rep. Anthony Weiner and Rep. Nydia Velazquez held a press conference near Newtown Creek to call for a more aggressive clean up. "There has been a generation of cover-up," Mr. Weiner said. 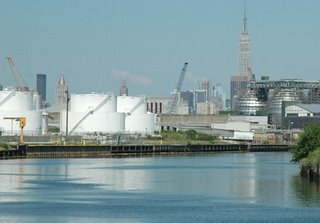 About 17 million gallons of oil are thought to have spilled under more than 50 acres of Greenpoint and the toxic plume is believed to be moving underground. The Environmental Proection Agency is examining the clean-up and will report to Congress next year on what needs to be done to complete the clean-up. Of course, what boggles the mind is that the spill was "discovered" in 1978, itself more than two decades after what was then Standard Oil fouled the environment in Greenpoint. Now, nearly 30 years after the "discovery" of what is the nation's biggest oil spill, critical studies are just starting, and nothing at all would be happening if Riverkeeper hadn't pushed the issue with a lawsuit. As reported incorrectly in the NY Post on Oct 15th by Angela Montefinise, reiterated incorrectly by Senator Charles Schumer at a press conference on October 16 and posted incorrectly on his website, there is a potential cancer cluster in Greenpoint on Devoe Street, near an oil spill that these cases are reported to be potentially linked to. However, three cases of an extremely rare sarcoma cancer are actually on a single block in Williamsburg (where Devoe Street is and nowhere near the oil spill, not even in the same zip code). One more case is five blocks away and even further away from Greenpoint and the oil spill. In fact, one victim got cancer after residing in the same apartment as an unrelated cancer victim and previous tenant. Sarcomas are a very rare form of cancer, and as reported in the Post article, "You don't see three in one block," Dr. Isaac Eliaz, a California expert on metal detoxification, said. "Someone should be paying attention to this." Dr. Kanti Rai, chief of oncology at the Long Island Jewish Medical Center, agreed that it was "worth an investigation." Unfortunately, the Senator is calling for a health study with regard to the oil spill and is ignoring a potentially very serious heath disaster in the Williamsburg community. Neighborhood Roots has reached out numerous times to Senator Schumer's Washington office's communications director Eric Schultz, and Bret Rumbeck who handles environmental issues for the Senator, with no calls being returned. Curiously, at the same press conference Congressman Anthony Weiner stated that Greenpoint has a 25% higher asthma rate than the rest of the city. The only problem is that the two health studies done by the state and city show the asthma rate in Greenpoint to be between 25% and 50% lower than the rest of the city along with a 10% lower cancer rate. Where are they higher? You guessed it- Williamsburg. The State DEC is aware of toxic industrial sites in Willliamsburg near Devoe Street that could potentially be the cause of these rare cancers, but no one is calling for that study. "Instead, there seems to be a no holds barred attack on Greenpoint and a blatant disregard for the health concerns of the Willamsburg community. Neighborhood Roots questions whether the recent support of massive residential development in Williamsburg and the historic resistance from Brooklyn politicians to residential development along the recently rezoned Greenpoint waterfront has anything to do with this dissemination of lies. Which block of Devoe Street were these rare sarcoma cases found?